This pesto veers a bit from the basic basil variety. Although the usual suspects are still there – pine nuts, parmesan, and garlic – this version has a kick from the peppery arugula and lemon zest brightens it up on the back end. I love the bright green color and its fresh flavor – it just smells like summer. The slight bit of lemon shines through, while that most amazing aroma of freshly picked basil is unforgettable. The other unforgettable part of this arugula pesto recipe is the fact that it takes all of 5 minutes to make. Just pop all the ingredients into your blender or food processor (PS – how cute is this pink one?) and give it a good whirl. I like to pulse it instead of giving it a steady blend, so that I can control the texture better. I like mine to be a bit on the thicker side, so that you can still see those flakes of basil and arugula. And don’t forget to taste for flavoring again at the end. I tend to add in another good pinch of salt at the end and then give it one more quick pulse to combine. I could eat this arugula pesto on everything – drizzled on some grilled lamb, on top of a caprese salad, or dolloped into a bowl of lentil soup with sausage & kale. Use it to dress up a turkey sandwich. Stir it into hummus or ranch for a delicious dip. Drizzle it over some grilled chicken skewers. Toss is with a bowl of freshly cooked pasta or zucchini noodles (as I did below). Combine it with some olive oil and red wine vinegar (or lemon juice) for an amazing salad dressing. Use it as a dip for grilled or roasted vegetables. Can you make Arugula Pesto ahead of time? You can make arugula pesto up to three days ahead of time. Pour it into a container and cover it with a thin layer of olive oil. This will prevent browning and help to preserve that bright green color. Can you freeze Arugula Pesto? You can freeze arugula pesto! Just pack it into a mason jar and cover it with a thin layer of olive oil. It will keep in the freezer for up to three months. Arugula Pesto has peppery kick from the arugula and is flavored with parmesan, garlic, lemon zest and pine nuts. Use this pesto to dress up a sandwich, stir it into hummus or ranch, or toss it with a bowl of pasta! Process arugula, basil, oil, parmesan, pine nuts, lemon zest, garlic and salt in a food processor or blender until finely chopped; season with pepper, to taste. Serve immediately or store in the refrigerator covered with a thin layer of olive oil for up to three days, or in the freezer for up to three months. If you loved this Arugula Pesto recipe I would appreciate it so much if you would give this recipe a star review! Also, be sure to snap a picture of how you served your Arugula Pesto and share it with me on Instagram using the hashtag #platingsandpairings and tagging me @platingsandpairings. 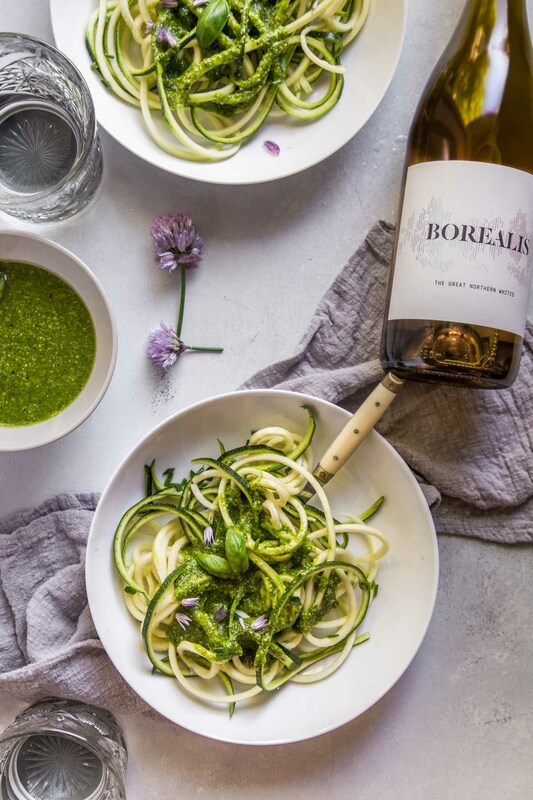 I paired this arugula pesto with Montinore Estate’s Borealis an easy drinking white blend of Müller-Thurgau, Gewürztraminer, Riesling and Pinot Gris. Viognier has a great lush texture with mild acidity – It pairs nicely with the bite of the arugula and the richness of the cheese. A ripe, full-bodied Chardonnay will also fit the bill here. It’s creaminess is a great match for the bright flavors in the pesto. Thanks Susannah! I was looking for a new twist and I think this turned out to be a great option!!! Gorgeous pesto Erin! Love using vibrant fresh ingredients. Great recipe and photos. 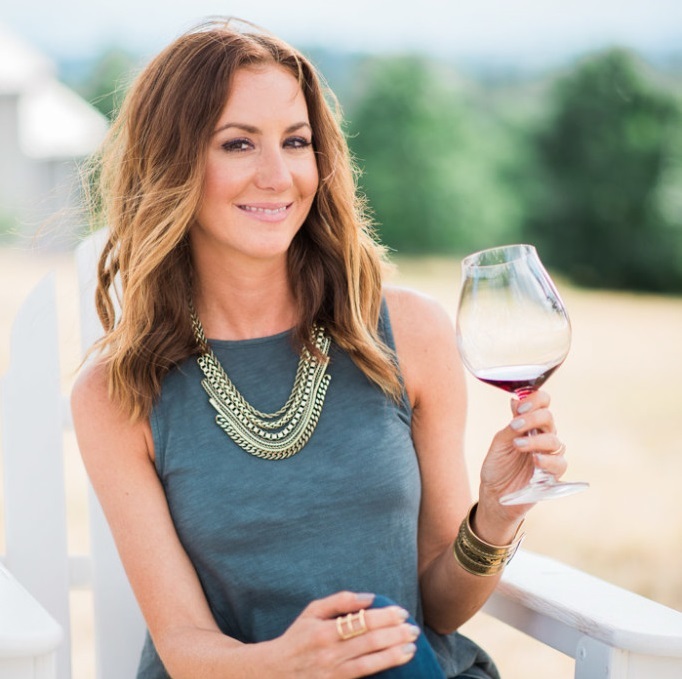 I love your beautiful blog! Thanks so much Allie! I appreciate the kind words!!! What a great idea Annika – I’ll have to give that a try! What a delicious idea! Will definitely be trying this next week. Thanks Lena! The bright flavors are perfect for summer! Yum, this looks good! Is it too bitter though with the arugula base? I don’t find it too bitter Catherine – It does have a peppery kick to it though! I like the peppery kick of arugula but never thought to use it in pesto, I’m keeping this in mind next time! I hope you like it Pech! Great tips on using pesto in other recipes!!! This looks incredible and I can’t wait to try it (especially over some grilled steaks this summer!). Yum. 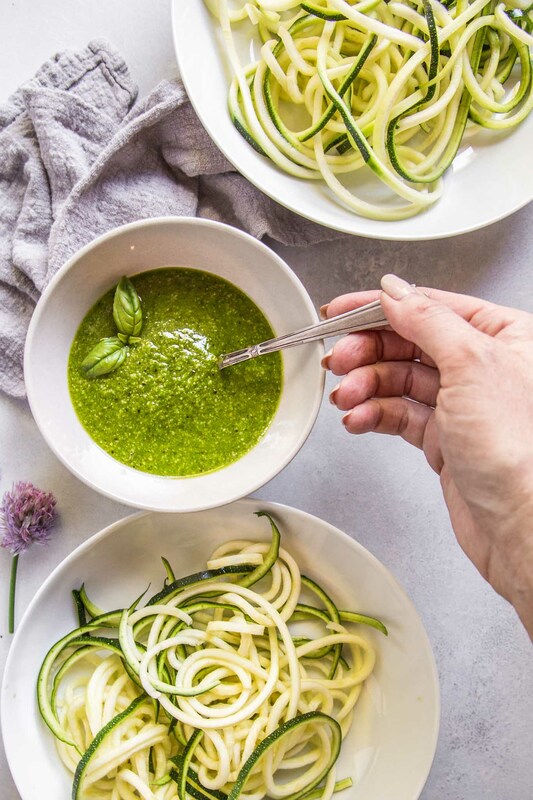 Pesto and zoodles, my kind of recipe for sure. Thanks for sharing. Blog name is lovely! Erin – my husband just made this (but we added a little basil to it). He served it with beet gnocchi! It was sooo good and you are right, it DOES smell just like summer. So happy to hear that you both loved it Maritha! I love your idea to serve it on beet gnocchi!